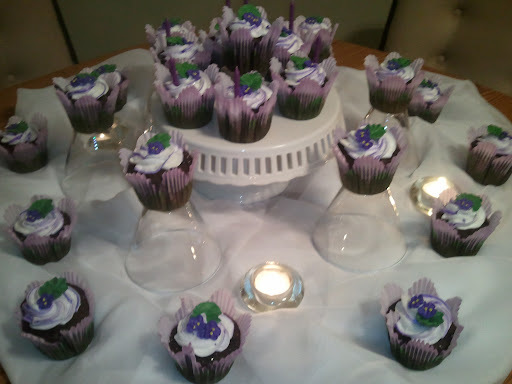 Megan wanted cupcakes for her 25 th, so, she gets cupcakes!!! 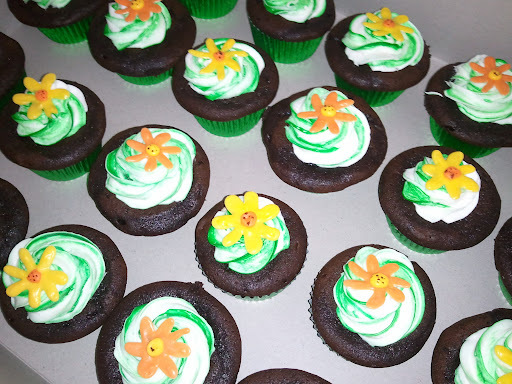 A Friend of mine needed cupcakes for a birthday celebration at the bank and she asked me to make them. Grant and his buddy, Zach, kept eating the little white chocolate flowers while I was making them, hoping I would mess up so they could eat the rejects! 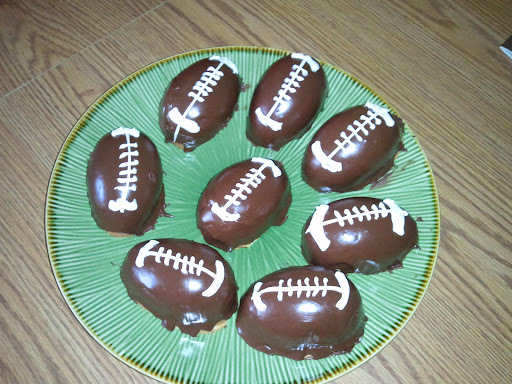 Here are my football cakes! Who says Easter Egg cake pans are only for Easter eggs? I say they make awesome football cakes for the Super Bowl, too! Today is Super Bowl Sunday and whether you are a Packers fan or a Steelers fan - it's party time! This is one of those days that you go OFF the diet - and have fun with food! Even though I am only having a small family affair during the game - we are having some "super" food! Have a Super Day and I hope that whatever team you are cheering for is the one that wins! 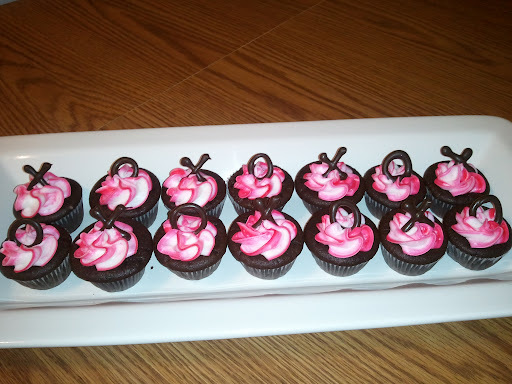 I was just reading a comment from my best friend, Kim, in Atlanta, and she is wanting to make "Filled Cupcakes" so I thought I would just share an idea I came up with a while back that has been a huge hit. I always like to "accent" my cupcakes with some sort of filling - and since so many people are trying to watch their weight - I decided to try this with Angel Food Cake Cupcakes. These were so good that I have made them over and over again, by request! All I used was an Angel Food cake mix - prepared like it directs - but I poured it in cupcake liners. When they were done - I let them cool - and then with a sharp knife I cut an "x" in the top of each one. 1 8 oz container of Cool Whip and squeeze in enough chocolate syrup to make it look like a light "chocolate milk"...maybe 1/4 cup. Mix it well and put it in another Ziplock bag. If you have a decorating tip - use that....(makes it look pretty) ...but if not - just snip the corner like you did for the filling. Squeeze a pretty dollop of topping onto each cupcake and then LIGHTLY sprinkle the tops with cinnamon. I call these "Mexican Kisses" - very light and low fat - but pack a powerful flavor punch! But I digress.....this is all about the filling! You can use the filling in chocolate cake, vanilla cake, yellow cake.......whatever you want! Its yummy!